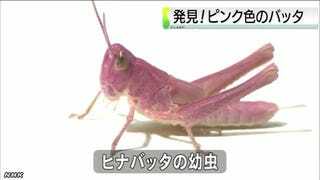 A sixth grader in Gunma Prefecture, Japan recently discovered a pink grasshopper—which is "extremely rare." It and the boy ended up on NHK, the country's equivalent of the BBC. As The Huffington Post points out, not much is known about pink grasshoppers other than it's thought the mutation is caused due to the grasshopper having too much red pigment and not enough black pigment.